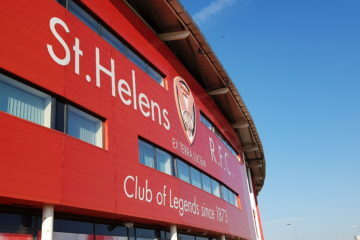 Salford Red Devils are today’s club in focus and my thanks go to Paul Whiteside for his time answering these questions. 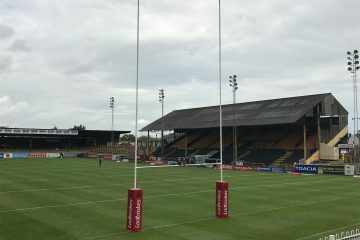 Paul writes his own column at Paulwhitesiderugbyleague.wordpress.com and has recently interviewed Ian Watson for the Salford Supporters Trust. I’ve watched Salford all my life. My dad starting going with his older brother Jeff in the late 60s. Jeff was a good player at Folly Lane and signed for our rivals Swinton. My dad caught the bug and followed Salford home and away. He would also watch Jeff at Swinton when we weren’t playing. Sadly Jeff got injured in an A team game at Rochdale and after a few months in a hospital passed away from his injuries. My dad drummed Salford in time from an early age. My first match was Rochdale Away Easter 1983. We won 0-7, Paul Fletcher scored, I was only a few months old. My first full season as a ticket holder was in 1987/88. I was a big HE MAN fan and seeing Tex Evans on the wing (who looked like him) got me hooked. That was it, I would do scrap books, collect programmes and memorabilia. Travel home and away with my dad spending most of our time thinking, worrying and talking about Salford RLFC. As I’ve got older my obsession has grown. I plan my life, family and shifts around them. It drives my wife mad, I’d be lost without them. I think supporting a team you love is special, you are part of a family. Hero’s, heartbreak and hope. Salford RLFC. Last season was tough with injuries, particularly losing such a bright young player in Kris Brining before the season even started. We also lost Manu Vatuvei to injury which put us behind the eight ball from round one. Losing to Leigh in the challenge cup was a big disappointment and heading in to the qualifiers we looked in grave danger of being relegated. Ed Chamberlain and Greg Burke arriving from Widnes gave us a huge boost. Then add to that Hastings and Lussick our season turned round. The catalyst being a terrific performance at Hull KR in the opening round of the qualifiers. This gave us the belief we needed to survive. Arguably the biggest signing Salford have made is the retention of Jackson Hastings. 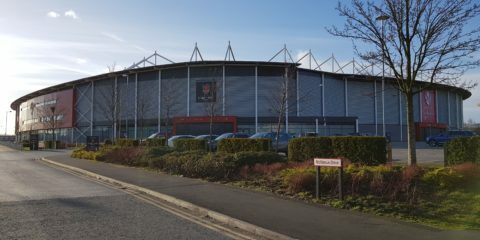 How crucial to Salford’s success is a fit, focused Hastings? Are you happy with the rest of your recruitment as a whole (both in and out)? Is there any other position you would look to strengthen? Jackson has been fantastic for Salford both on and off the pitch. He has helped raise our profile and formed a close bond with the supporters. There’s no doubt that Hastings and Robert Lui in there day can match any half back partnership in the league. The main focus for Hastings is to keep a cool head and not let his passion get the better of him. Last season he was a bit of an unknown quantity. In 2019 teams are definitely going to target him. The squad is a little on the light side but there’s plenty of quality in the there. Ken Sio is an exciting signing and the pack has been strengthened after losing quite a few forwards. There’s always room for a big nasty second rower and if one came available I liked to see us snap him up. Who should we be looking out for in a Salford shirt this year (and why)? Niall Evalds is definitely a player to watch again. His lighting pace and ability to finish make him a constant threat. He’s a tremendous support player and a guy who lives the life off the field too. Jackson Hastings gets to test himself against the best sides in the league. Last year he played in the qualifiers but in 2019 he will be on the big stage week in week out. Young players Josh Wood, Jake Bibby and Daniel Murray will be looking to progress after a solid 2018 season. Daniel Murray again made his mark last year. The young prop has some stiff competition in the pack but I expect him to make his mark and hold down a place in the first team. He likes to land on his front and get a quick play the ball as well as being a really good defender. I like the changes if I am honest. When we had the top 5 concept a number of years ago I enjoyed it. I think the eights left to many teams in jeopardy at the bottom and a the top there were a lot of dead rubber games. I think a top five playoff we reward teams in a fairer way. I think 2019 will be tough. All the teams have improved. It will be 50 years since our last visit to Wembley in 1969 so the hopeless romantic in me is dreaming of a good cup run and going all the way. On our day we are capable of beating anyone in the league it’s finding the consistency and keeping key players fit. I like the look of the spine of our team and hopefully we can win more than we lose and improve on last season. I’ve tipped Saints to finish top and make the Grand Final. There a fantastic team who play the game the right way. I’ve seen Salford lose so many matches against Saints particularly away from home. I wasn’t born the last time we beat Saints away (January 1980) my dads told me all about it though. It was hard to take in 2017 when we were 8-24 up before that crazy comeback and Matty Smiths drop goal. That’s what being a Salford supporter is about, you dust off and go again the week after. James Roby always seems to have a great game against us and I’ve a feeling he could be up there battling for the Man of Steel. So much pace in the back line which some wonderful finishers. I am a big Tommy Makinson fan too!